The team visited La Paz Waterfall Gardens Nature Park in San José. From left: Crystal Allen, Cierra Johnson, Coach Krista Gerlich, Miranda LeJune, Shelby Richards, and Rebekah VanDijk. 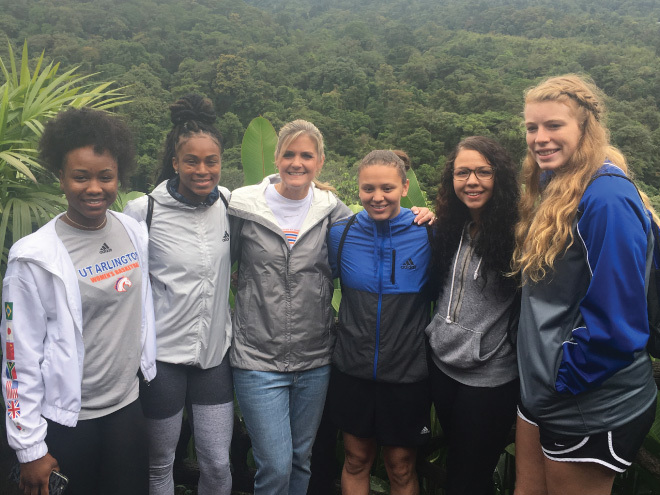 Since returning from a summer tour of Costa Rica, the UTA women's basketball team is still basking in the experience of the eight-day, four-game adventure to Central America. The journey south catapulted the team into the 2017-18 season, with chemistry being as tight as ever approaching tipoff last November. During the summer tour, UTA played four games over four days with matchups against the University of Ottawa and the Costa Rican National Team. The early-year action gave the coaching staff and players a chance to build in aspects of practice they would usually not get to take advantage of until October. Outside of the gym, the days were packed with experiencing San José, Costa Rica. The team took part in a city tour, explored the local marketplaces and visited waterfalls in the rainforest. One special day included a visit to a local orphanage, where the team and its coaching staff were able to experience a day in the life of local kids while giving back to the community. "It was really exciting to be able to experience the team in a different setting," says senior Rebekah VanDijk. "We see each other every day in school and in the gym, but to see my teammates in that environment was really inspiring." After returning to Arlington, VanDijk has looked back at everything gained from the trip and knows that the team was able to grow together and set themselves up for a special 2017-18 season. "The trip has already helped us­­­—in practice, the intensity has been really high," she says. "Being able to play other teams propelled everyone to be really excited for what is to come."